1Display the Quicken home page. 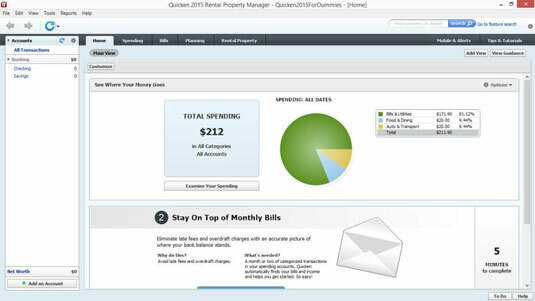 Click the Home tab, and Quicken displays the Quicken home page. You remember this puppy. 2Click the Add an Account button to set up a new account. The Add an Account button appears in the lower-left corner of the window. Quicken, of course, is no fool, so it displays the Add Account dialog box. 3Set up a cash account. You can guess how to do this, can’t you? You indicate that you want to set up a cash account and then simply step through Quicken’s questions about the account you want to set up. You need to give the account a name, such as cash or pocket money. 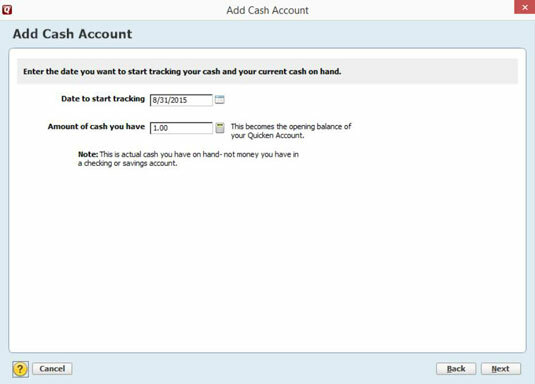 And you need to provide a starting balance value using the faithful, familiar Add Account dialog box. 4Click Next and then click Done.